One of a kind custom sword by Australian Artisan Brendan Olszowy. Original, 100% hand made sword - the only one in the world. A slap to the face was what he expected, but a sharp point to the throat was the welcome he received. Calling on his past friend had been this skint traveller’s best hope for respite from a cold damp night, though in truth a warm meal and a bed shared were among his loftiest dreams for this gamble... suddenly seaming a little too far fetched. Only too late did he remember leaving Lambradesca this blade; “To shield you from scoundrels, my dear”. When he realised the label fit him too, he decided sheepishly to wear it with humility. While Lambradesca’s smirk and twinkling eye led him to wager there may some luck yet to come of this venture. Brendan Olszowy works from his home workshop in rural Western Australia custom making his swords one at a time by himself. With an eye for detail as wide as the Australian outback itself, each sword is made entirely by hand and made to the highest possible standard. Making only 10-15 swords a year Brendan works slow and steady to make sure the work is done to the pinnacle of his talents, and only works when his head in the right space to do his very best. Hours of grinding, shaping, filing, and sanding with sandpaper on a cork block go into each piece. Spray from the angle grinder cements the walls of his grinding & forging shed and there's often blunted files and torn up sheets of sandpaper kicking around the floor. In his Machinery Shed he has a hand operated Milling Machine and Lathe - allowing him to machine straight slots in hilt furniture, and fullers in blades, and the lathe for shaping some pommel forms. All of the swords Brendan makes are REAL swords. Fully functional. Built for durability, and to perform as a live sword for performance cutting. They are not toys, wallhangers, or stage props. They are built to perform to their purpose, with excellent heat treatment qualities and excellent blade and edge geometries. All blade steel stock used is brand new 9260 high carbon spring steel cut from the length. The blade and edge geometries are finely hand crafted to historical principles and the blades are heat treated in a purpose built electric kiln. 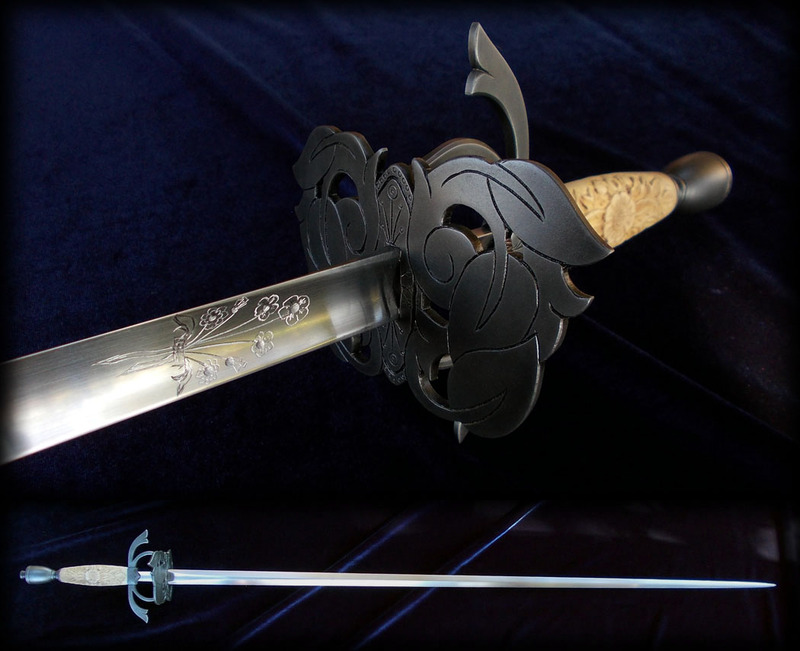 All swords are hand sculpted individual pieces - earning all of his attention. Being handmade they rely on a steady hand, a keen eye, and a feel for how the metal is taking shape. As such they have a smoother, more organic look and feel about them, compared to machine finished items. He does spend a long time fussing, trying to get little details just right. The pieces are NOT computer cut, but sculpted with painstaking attention - by a loving human hand. "I think I am my toughest critic - perfection is in the eye of the beholder. Each piece has endured many hours at my hands, being crafted into it's final form. Through these hours at my hands I feel the result is true meeting of imagination, the human body, and the form that lives within the wood and steel. Each piece is a true one of a kind. My blades don't have a mirror polish, but rather a hand sanded satin finish. The satin finish is beneficial to maintenence throughthe sword's active life. All blades are sculpted from new flat-bar stock. I do not forge my blades. We are blessed with space-age steel which requires no further forging, only shaping. Pommels and guards are sculpted by hand from solid blocks of mild steel or bronze, not cast en-masse. Grips have a wood core, crafted from Poplar or Beech, before they are leather covered. Though I love featuring hand carved exotic wood grips from Australia and around the world too. All swords have broad full tangs with radiussed shoulders for strength; built to be a fully useable tool. The temper of the tang and shoulder is drawn back with a torch to low 40s Rockwell hardness; made softer than the blade proper to enhance durability, and reamining annealed (unhardened) back at the pommel mounting; for maximum shock resilience. I control the heat treatment in a purpose built electric kiln, which I made myself to suit my needs. This provides uniform heat to the whole blade, and precise digital readings for me to accurately control the temperatures. Heat treatment of blades includes normalisation cycles, quenching in oil to harden, and multiple tempering cycles giving a resilient edge hardness of approximately 50-54Rc. depending on the design requirements of the sword." As Brendan wishes to welcome every Fable Blades owner with their own personalized service experience, he does not list them for sale with the usual click and buy method, preferring to take a little time to ensure that you understand what you will get and make sure it really is the right sword for you. There may also be options to further individualize your sword. If you are interested, simply click the inquire button near the top of this page to get the process started or to inquire about your own custom design concept sword.